This one would be a good one for younger Twilight fans. Vampire fun with out the intense slightly stalkerish creepy relationship. I have been in reader HEAVEN! All of my favorite YA series have had another book come out. Septimus Heap has Queste out. After I finish devouring that, I get to hop on to Libba Bray’s third book wrapping up The Great & Terrible Beauty trilogy. Then, it’s on to Pullman’s prequel to the Golden Compass. I am so excited! I have such a huge stack of lovely looking fun reads that it’s making me giddy. 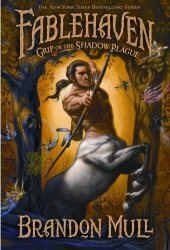 This one is the third in Brandon Mull’s Fablehaven series which is really quite likable. Normally, I like young adult books that are for the older readers whereas this one is more middle school level. It’s still a thick seemingly complex book though so I’m still a fan. I’ve had good luck with recommending this one because there’s really nothing for people to dislike. In this corner weighing in at 645 pages, I have a set of books set of books which are urban faeire tales with Seelie folk walking around with glamours to shield us mere mortal from their cruel beauty. And in the other corner weighing in at 653 pages, I have a set of books set of books which are urban faeire tales with Seelie folk walking around with glamours to shield us mere mortal from their cruel beauty. Hmm, wait. When I read the first book in each of these sets (where the second book is slightly related to each other as in they take place in the same world, but the second book isn’t a true sequel of the characters in the first books), I liked Melissa Marr’s tale slight better than Holly Black’s. Neither are fantastic books but there was something compelling about each one that kept me from stopping halfway through. They both try a little hard to be cool – look my humans have tattoos and problems! and so forth. I didn’t love either book enough to whole heartedly recommend it to someone (unless they were a fan of the genre) but they weren’t horrible. Pretty much they’re on the same level – if you liked Holly Black’s books, I’d recommend Marr’s to you or vice versa. However, Wicked Lovely & Ink Exchange have gorgeous covers so I declare them the winner by a hair! I’m behind the times on this one, but it works in my favor since it means the second and third sequel to it are already out so worry about forgetting details as I wait for the sequels to come out. The reason I hadn’t picked it up before is a friend had read it and scrunched her nose at it. I don’t know if I would have liked it as much as I did if I had not gone into reading thinking that I might hate it. Turns out it was a nice light (but not happy) read. It was just what I was in the mood for and I love when that happens. Spooks, boggarts, and witches – oh my! 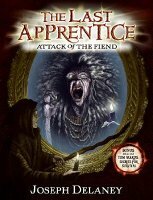 This is the fourth in the Last Apprentice series which is a middle school level fantasy/horror series. I can’t handle scary things so a fifth grade horror book is about as much as I can handle. This is a good series that I’ve been fond of suggestion to that age of readers. With this new addition, I’m a little weary to recommend it because it deals a lot with believing in God. I think it’s good for children this age, but I don’t think every child’s parents would agree with me. Obviously, I had to read these books before I saw the movie. To be honest, they’re kind of annoying. I realize they’re children books but each individual book is so insignificant it’s hardly worth it. The entire series counts for one book – even for a middle school reader. I mean seriously. Of course, I read them so I could see the movie and now I’ve heard nothing but poor reviews for the film so I shall wait until it comes out on dvd. Alas, alack!